Its Christmas time again! 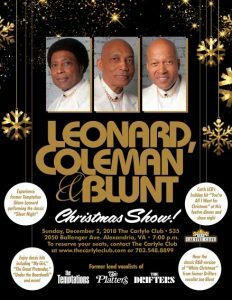 LCB, featuring Leonard, Coleman, and Blunt, the former lead singers of The Temptations, The Platters and The Drifters is headlining the Annual “LCB Christmas Show” at The Carlyle Club in Alexandria VA, on Sunday, December 2nd at 7 pm. They will be performing their original Christmas single, “You’re All I Want For Christmas, written and produced by group member Joe Coleman. Bring your family and all your friends for a great night of music and fun! Birthdays, Anniversaries, girls/guys night out, friends and family in town, need a night out with someone special? Celebrate the holiday season with great Christmas music and all the hits you know and love from The Temptations, The Platters and The Drifters including, “Silent Night”, “White Christmas”, “This Christmas”, “Give Love On Christmas Day”, “My Girl”, “Only You”, “Under the Boardwalk”, “Smoke Gets In Your Eyes”. Enjoy Holiday classics and classic hits with LCB as they bring their rich blend of Christmas hits and showmanship to the stage… wowing audiences both nationally and internationally with their tight harmonies and exquisite craft. Doors open at 5 PM for dinner. Convenient parking right under the building! Leonard, Coleman & Blunt are managed by Burke Allen and Allen Artist Management, a division of Allen Media Strategies LLC of Washington, DC. Glenn had a long and illustrious career as the first tenor and lead singer of The Temptations from 1975 to 1983. He performed on 10 albums with The Temptations, singing lead on many songs including "I'm on fire,” "Go for It," "The Best of Both Worlds," "Open Their Eyes," "Ever Ready Love,” and the classic Christmas song "Silent Night" from The Temptations' Give Love At Christmas LP. Joe was a member of “The Platters” for 23 years and was a regular at the Sahara Hotel in Las Vegas performing popular songs such as “Only You”, “My Prayer”, “Smoke Gets in Your Eyes”, “The Great Pretender” and many more Number One hits. Joe Blunt began his professional singing career, at the age of 18, when he signed his first recording contract with DC’s Cap City Records as a member of R&B vocal group, “The Chancelors” and in 1975, Joe Blunt became a member of the legendary Drifters.